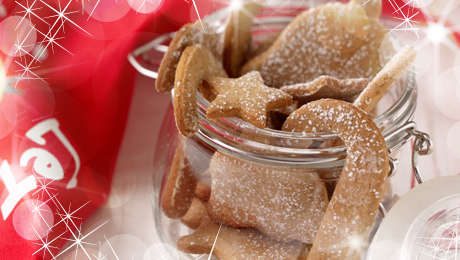 These tasty treats make super Christmas decorations too. Place the butter, golden syrup and brown sugar in a bowl and using an electric whisk beat the mixture until pale and creamy. Sift in the flour and bicarbonate of soda and combine using a wooden spoon. Add the ground ginger and cinnamon and again stir to combine. Turn the dough out of the bowl, knead gently, then roll out on a lightly floured surface until approx 3–4 mm in depth. Cut out shapes from the dough and place on parchment lined baking trays. Bake for 12–15 minutes, then remove from the oven and set aside to cool.